Katya offers to pay you $10 at the end of every year for the next 5 years (t=1,2,3,4,5) if you pay her $50 now (t=0). You can borrow and lend from the bank at an interest rate of 10% pa, given as an effective annual rate. Will you or Katya's deal? According to the theory of the Capital Asset Pricing Model (CAPM), total risk can be broken into two components, systematic risk and idiosyncratic risk. Which of the following events would be considered a systematic, undiversifiable event according to the theory of the CAPM? (a) A decrease in house prices in one city. (b) An increase in mining industry tax rates. (c) An increase in corporate tax rates. (d) A case of fraud at a major retailer. (e) A poor earnings announcement from a major firm. A wholesale vitamin supplements store offers credit to its customers. Customers are given 30 days to pay for their goods, but if they pay within 5 days they will get a 1% discount. What is the effective interest rate implicit in the discount being offered? Assume 365 days in a year and that all customers pay on either the 5th day or the 30th day. All of the below answer choices are given as effective annual interest rates. All things remaining equal, according to the capital asset pricing model, if the systematic variance of an asset increases, its required return will increase and its price will decrease. If the idiosyncratic variance of an asset increases, its price will be unchanged. What is the relationship between the price of a call or put option and the total, systematic and idiosyncratic variance of the underlying asset that the option is based on? Select the most correct answer. (a) Systematic variance of the underlying asset increases. (b) Idiosyncratic variance of the underlying asset increases. (c) Systematic, idiosyncratic or total variance of the underlying asset increases. (d) Systematic variance of the underlying asset decreases. (e) Systematic, idiosyncratic or total variance of the underlying asset decreases. ##V## = Market value of assets. ##E## = Market value of (levered) equity. ##D## = Market value of zero coupon bonds. ##F_1## = Total face value of zero coupon bonds which is promised to be paid in one year. The levered equity graph above contains bold labels a to e. Which of the following statements about those labels is NOT correct? 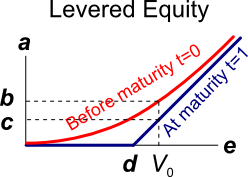 (a) Label a represents the market value of equity ##(E)## at t=0 on the red curved line or t=1 on the blue crooked line. (b) Label b represents the market value of equity now ##(E_0)##. (c) Label c represents the market value of equity if the assets were liquidated right now. (d) Label d represents the face value of debt at maturity ##(F_1)##. (e) Label e represents the market value of debt ##(D)## at t=0 on the red curved line or t=1 on the blue crooked line. (a) Believe that asset prices follow a random walk. (e) Believe that the theory of weak form market efficiency is broken. Which of the below formulas gives the payoff ##(f)## at maturity ##(T)## from being long a put option? Let the underlying asset price at maturity be ##S_T## and the exercise price be ##X_T##. What derivative position are you exposed to if you have the obligation to sell the underlying asset at maturity, so you will definitely be forced to sell the underlying asset? The Chinese central bank has the largest amount of foreign currency reserves.